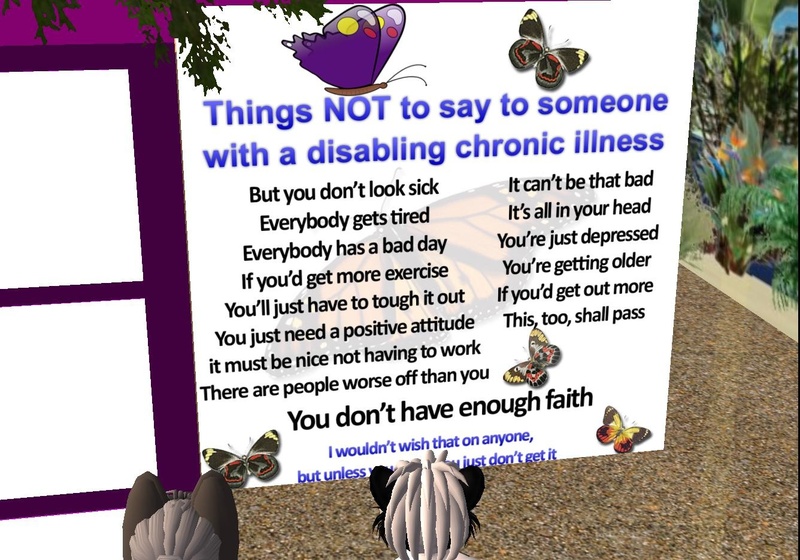 I remember reading somewhere more than twenty percent of Second Life Residents have some kind of disability. Some keep quiet about it. Others mention it to friends after a while. And some are open about it to friends and strangers alike. One such friend, a Christian and mother of two, had the misfortune to be stricken with fibromyalgia, a painful disorder that is thought to affect between two and four percent of people. She has encountered a number of people in Second Life, many sympathetic and offering well-wishes and prayers. But a few seemed insensitive, or were clueless in what to say. 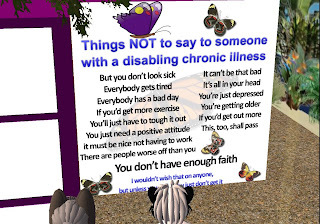 So on her public garden, she posted a list of “Things NOT to say to someone with a disabling chronic illness.” She tells me she had heard them at least once. She tells me she had heard each of them at least once. So eventually, she felt the need to make the poster and put it up as a reminder that for the chronically ill, words truly can hurt.